Americans express mixed opinions about a possible independent Palestinian state, an issue that has so far drawn little attention from the press or the public. More favor (42%) than oppose (26%) the United States recognizing Palestine as an independent nation, while nearly a third (32%) express no opinion. Yet the public’s sympathies in the Middle East dispute remain more with Israel than the Palestinians: 40% say they sympathize more with Israel, while just 10% sympathize more with the Palestinians; 21% volunteer that they sympathize with neither side, while 25% express no opinion. The latest survey by the Pew Research Center for the People & the Press and The Washington Post, conducted September 15-18 among 1,006 adults, finds substantial partisan differences in opinions about the Israel-Palestinian issue. More than half of Democrats (54%) say the U.S. should recognize Palestine as an independent nation while just 14% oppose this step. Among independents, more favor (45%) than oppose (28%) the U.S. recognizing an independent Palestinian state. 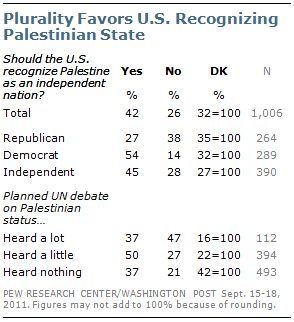 But just 27% of Republicans favor U.S. recognition for Palestine, while 38% are opposed. This week’s planned debate at the United Nations over Palestinian statehood has mostly been off of the public’s radar. Just 10% say they have heard a lot about the upcoming debate, while 38% say they have heard a little; fully half (51%) say they have heard nothing at all. Press coverage of this issue has been minimal as well, according to an analysis by the Pew Research Center’s Project for Excellence in Journalism (PEJ). Last week, less than 2% of all news coverage was devoted to the debate over Palestinian statehood, far less than the amount of coverage devoted to the U.S. economy (20%) or the 2012 presidential campaign (12%). Nearly half (47%) of the small number of Americans who have heard a lot about the planned U.N. debate oppose the U.S. recognizing Palestine as an independent state; that compares with 27% of those who have heard a little about the issue and 21% of those who have heard nothing about it. 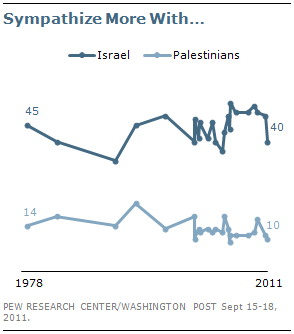 The public’s sympathies in the Middle East dispute have changed little in recent years. These opinions continue to be divided along partisan lines: Far more Republicans sympathize with Israel (62%) than with the Palestinians (4%) or sympathize with neither side (14%) and 18% have no opinion. By contrast, 27% of Democrats say they sympathize with Israel while nearly as many (24%) volunteer that they sympathize with neither side; 15% of Democrats sympathize with the Palestinians. Nearly three-in-ten Democrats (29%) offer no opinion. Among independents, 41% sympathize with Israel, 22% with neither Israel nor the Palestinians, and 10% the Palestinians; 24% express no opinion. Perhaps reflecting the low visibility of the Israel-Palestinian dispute, nearly four-in-ten (38%) express no opinion of Barack Obama’s handling of the situation in the Middle East. About the same percentage (37%) say Obama is striking the right balance in his handling of the situation; 20% say he favors the Palestinians too much and just 5% say he favors Israel too much. Since May, the percentage offering no opinion has increased from 24% to 38%, while the percentage saying Obama is striking the right balance has declined by 13 points (from 50% to 37%). There has been no change in the numbers saying Obama is too supportive of either the Palestinians or Israel.